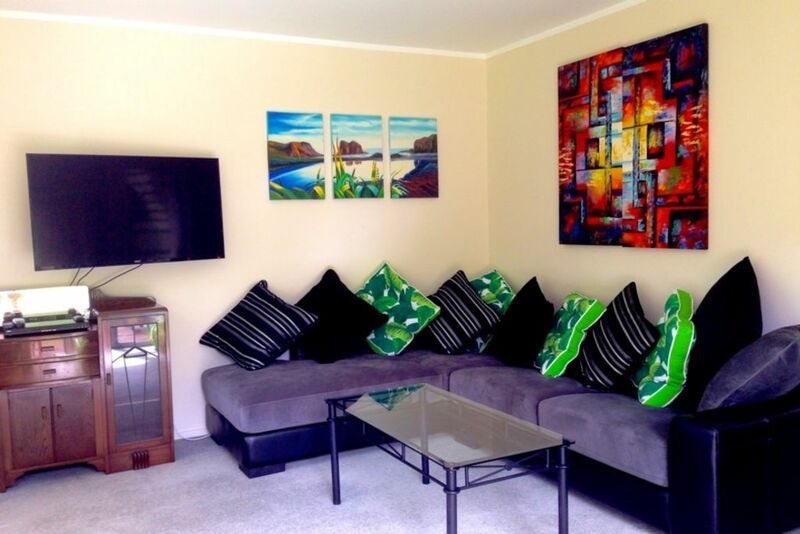 Waihi Beach Accommodation, five minute walk to the beach, shops, cafe. Private peaceful grounds, safe, newly renovated and is fully equipped with everything to enjoy your holiday. Includes Sky, two decoders, Tv with sport and movies, Wireless Internet, off street parking for two cars, fully fenced, small dogs permitted but must inform with initial booking. Animals must stay outside. We offer a generous sized lounge, dining , kitchen area. In the outside area, off the lounge there is a Bbq and outdoor chairs available. Bedrooms are made up so you can relax and start your holiday from when you walk into our home. In the cooler months heating is in all the bedrooms and we have a cosy woodburner to warm the living areas. Dry wood is supplied. In summer we have several fans available.All linen and towels are included in our home rate. Short walk to beach , shops , cafes, over looks the mountains and farmland. Homely, private, quiet, fully fenced large section, pet friendly, off street parking maximum two cars. Pets allowed with prior approval and to be kept outside at all times. Freshly renovated, comfortable decor, cosy fire (winter months) and heating throughout,with all the modcons. Bookings will be accepted for a minimum stay of 4 days. Great location, well appointed bach. We had a really awesome Easter holiday, and also very much appreciated being able to include our dog. Thanks guys. The bach was everything you'd want and more. Very clean and tidy and realky does have everything so you don't have too. We throughly enjoyed our stay. Great location too. Lovely property . Very private. 5-7 min walk to beach. Beautiful property close to the beach with plenty of space for the whole family. Property was in clean, very organised condition with everything we needed. Property was in clean, very organised condition with everything we needed. The bikes were a huge hit and the outside area was ideal for our dog (although not that much shelter from rain and areas of the fence line need 'dog proofing' - weren't biggies fir us though). Location was easy access to beach and shops but a little tucked away so private and quiet. We would definitely consider staying again.